Cupola Furnace is a melting device used to melt cast iron, Ni-resist iron, and some bronzes and It is used in Foundries. The cupola can be made of any size and the size of the cupola is measured in diameters which range from 1.5 to 13 feet. The shape of the cupola is cylindrical And the equipment is arranged in the vertical fitted with doors which swings down and Out to drop bottom. The top is open or fitted with a cap to escapes gases or rain entering. The cupola may be fitted with a cap to control emission of gases and to Pull the gases into the device to cool the gases and remove all the Particulate Matter. The cupola shell is made of steel and has a refractory brick and plastic refractory Patching material lining. The clay and sand mixture is used as a bottom line and the lining is temporary. The coal can be mixed with the clay lining so when it heats up the coal decomposes and the bond becomes friable. This makes opening up of the two holes easy. The bottom of the cupola lining is compressed against the bottom doors. Cooling jackets are also fitted with some of the cupola’s to keep the sides cool and with oxygen injection to make the coke fire burn hotter. The cupola furnace works on a simple principal that combustion of coke generates carbon dioxide and heat and this causes the iron to melt. The iron drains downward when get melted. Afterwards, the carbon dioxide is reduced partly, reduced again by consuming energy and coke with carbon monoxide, carbon dioxide and supplied coke is present in the reaction equilibrium so it is possible to show a defined combustion ratio for the utilization of thermal energy for the coke combustion. Finally, high concentration of carbon monoxide is present in the exhaust gas and it can be extracted from the furnace. Cupola furnace constructed in the form of a hollow cylindrical vertical steel shell and it is lined from inside with a refractory material. This furnace is generally supported on four cast iron lags mounted on a concrete base. The bottom of the furnace is closed by two cast iron doors hinged to the bed plate of the furnace. A wind box cast iron encircles to the outside of the furnace bottom.This box is connected to the furnace blower pipe known as the blast pipe. Air which supplies the oxygen necessary to burn the fuels forced through the cupola by a blower.The top of the furnace is shielded by a mesh screen and topped with a cone-shaped spark arrester, which permits the free vent of the waste gas and deflects spark and dust back into the furnace. After building the cupola make sure it is dried completely before getting it to fire. Any slag around the tuyeres from previous runs needs to be cleaned properly. Also, A broken part is repaired with the mixture of the silica sand and fire clay. Over the Brunt area, a layer of refractory material is applied To about thickness 6 inches or more is rammed on the bottom sloping toward the tap hole to ensure better flow of molten metal. A hole opening of about 30 mm diameter and a tap hole of about 25 mm diameter is being provided there. a fire of wood is ignited. When the wood burns well coke is dumped on the bed well from the top. Make sure that the coke gets burned too. A bed of coke about 40 inches is placed next to the sand. Firstly The air blast is turned on At a lower blowing rate than as normal for provoking the coke. A measuring rod is also used which indicates the height of the coke bed. For about 3 hours firing is done before the molten metal required. Now the charge is fed into the cupola. Many factors like charge composition, affect the final structure of the gray cast iron obtained. It composed of 10% steel,50% grey cast iron scrap, and 3% limestone as a flux. Alternate layers are formed by these constituents. Besides limestone, fluorspar and soda ash are also used as flux material. The main function of flux is to remove the impurities in the iron and protect the iron from oxidation. after the fully charged furnace, it is allowed to remain as such for about 1 hour. As this process goes in charge slowly gets heated up as the air blast is kept shut this time and because of this, the iron gets soaked up. At the end of the soaking period, the air blast is opened. The topmost opening is kept closed till the metal melts. The sufficient amount of metal is collected. The contents of the charge move downwards as the melting proceeds. The rate of charging is equal to the rate of melting. The furnace is kept full throughout the heat. Closing feeding of charge and air blast is stopped when no more melting is required. The bottom plate swings to open when the prop is removed. The deposited slag is being removed.The cupola runs continuously and The melting period does not exceed 4 hours in most of the time. But can be operated for more than 10 hours. Very skilled operators are not required. Melting composition can be controlled. Small floor area is required. It is sometimes difficult to maintain the temperature in a cupola furnace. Metal elements are converted to their oxides which are not suitable for casting. 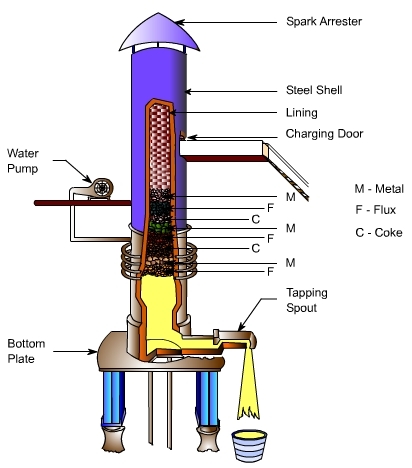 Cupola furnace is the only method which is continuous while operations. The melting rate of cupola furnace is high. It is easy to operate.Operating costs in use of cupola furnace is comparability very low to other methods for this purpose. Although having such great factors, the use of cupola furnace is declining and people are opting for electric induction melting. This is all about cupola furnace. If you have any query regarding this article, ask by commenting. If you like this article, don’t forget to share it with your friends on social networks. Subscribe our website for more informative articles. Thanks for reading it. ← What is Spring? 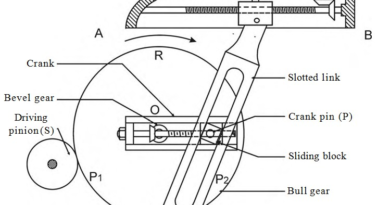 What are Types of Springs? Great information for those who need it. Thank you for sharing about the Cupola Furnace. Nice blog! how we can reduce coal consumption in cupola furnance..? ?